Crumble the cake without any big lumps. Add cream to the crumb cake and make it moist to roll shapes. Don't add too much cream, able to hold shapes thats it (Pic 1). Line a tray with parchment/wax paper and make shapes using cookie cutter. I have made small and medium heart shapes to stack one over another (Pic 2). Freeze it at least 15 minutes or overnight (Pic 5). Take the candy melts in a heat proof safe bowl, using double boiler method (Steam melt) or directly over boiling water or in microwave melt the candies (Pic 3). Now add Oil/vegetable shortening (I used both), optional food color and bring to dropping consistency (Pic 4). These melted candies dry out soon, so melt in batches and use small quantity. Apply melted candy at the back of small heart shaped cake and press it over the big one (Pic 6). You can make single layer cake too. Dip the stick in melted candy and insert it gently in to the heart cakes (Pic 7). Insert the sticks half way through. Dip the whole cake in to the candy melts with a help of spoon lift it up and tap gently to remove excess (Pic 8). Use some sprinkles and decorate the cake pops. Use any thermocol or whatever available at home to place the cake pops (Pic 9), still I am comfortable with my idli pan :-). It will dry out in another 2-3 minutes. After dipping immediately add sprinklers or customize your cake pops as shown in step wise picture below. If dried out do apply some candy melt to the back of each sprinkle and place it over the cake pops (Pic 10). Decorate it to your creativity. You may need to sprinkle whipping cream when you feel the cake dried out while making shapes. The shaped cakes should not melt at any time. As a beginner you can take few at a time from freezer and dip it. 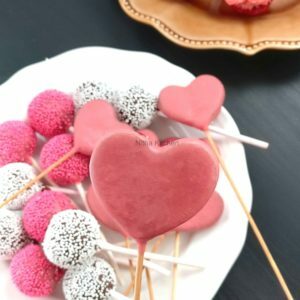 If they are out in room temperature for a long time then shapes turn out messy so always dip firm cake pops in candy melts. The cake pops once done and dried, avoid exposing it to too hot temperature, you can refrigerate it in that case.